Juba Lima is defined as “the worst paulista,” because his father is from Bahia and his mother is from Rio. However, this story is a long way since it was twenty years ago when he settled in Barcelona, ​​a city he fell in love with from London to see that he lived here very well “with the little girl “. In the Catalan capital, Caboclo has founded a footwear firm that combines the aesthetic inspiration given to Barcelona, the Brazilian craftsmanship that loves so much and a system of sustainable production that uses natural dyes and soles made with car tires .“And also sustainable with the people that produce it”, it highlights the brand. When he reached the age of majority, Juba Lima decided that he did not want to continue living in Brazil and marched to London. 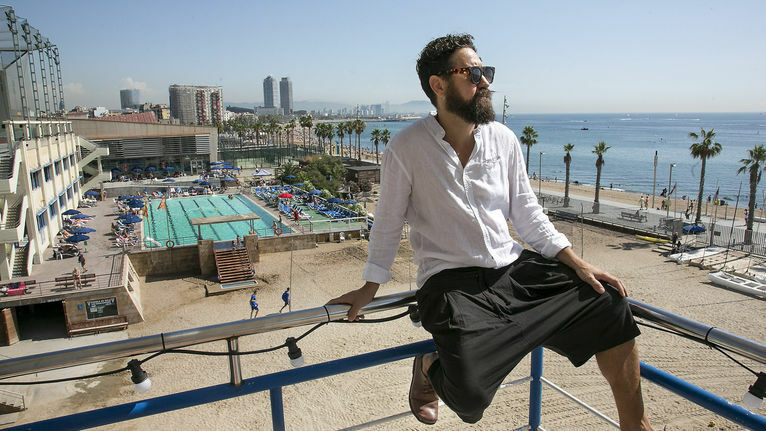 Once in the British capital, however, he discovered that his cousin, who lived in Barcelona, ​​”had fun three times, went to the beach every day and ate a lot better”. Three facts that made him choose to come to the Catalan capital, where he studied international relations. At the end he says he had two ways: “Or find a job here or return to Brazil. And there work in Brasilia, for multinationals, or prepare me as a diplomat. But I thought: “By God, what more boring life, I do not want this life”. At that moment, he said that the idea that he has occupied so far has come to him: “I thought that in Brazil we had master craftsmen with forty years of office and a very good product. Why do not we mount a brand with the crafts there? A brand that gives it value! “With that reflection in his pocket he went alone for six months in his country, looking for” the best cooperatives of craftsmen “, to which he wanted to give work but also well-being. “My country is very rich but full of very poor people, and that breaks my heart. For me it is impossible to live in a country with so many social differences . That is why I wanted to make my contribution.There are a lot of craftsmen. It’s the story of the typical guy who has not been able to study and has come forward with his hands. You know, the poorer one is more ingenuous, “he explains about the beginnings of his project, which at first was jewelry. “I bought a Belém cooperative, in the Amazon, that only made natural imitation jewelery, and revenge. It was lovely. I went with a sample shop to Formentera and it turned out that I sold a sale without knowing it to one of the owners of Natura. Three months later I went to sell my jewelry in the company and recognized me . He made me a great assignment that gave me a financial basis to set up my first store, “he says, still surprised. But that necklace store was very stopping in winter, and even more when the crisis came. That is why we wanted to launch shoes and ” Pablos Picasso del cuir” with “design.” After selling 40,000 pairs, Caboclo triumphs among many collectives, from Brazilians “who buy you because you are successful outside” to “Japanese, because wabi-know philosophy helps them value the imperfection” of the Shoes, which are “dressed without chromium, which allows to see all irregularities in the skin.” But not everyone is selling it in the online store that has opened. ” My best marketing is the customers , who thank God they repeat. With the problems with the tourism we have this year I was very worried. And my local clientele is saving me. “ Now that he has managed to “disseminate wealth” in his country, he says that the goal that he would like to fulfill is “to create the university of leather”. “Even though my craftsmen today already live well, they feel they have no social role. If I manage to create it, I can tell you that they are not the craftsmen of the square. I want to give them money but also pride, “he concludes.